When it’s not your week, it’s not your week and this week has been absolutely abject. 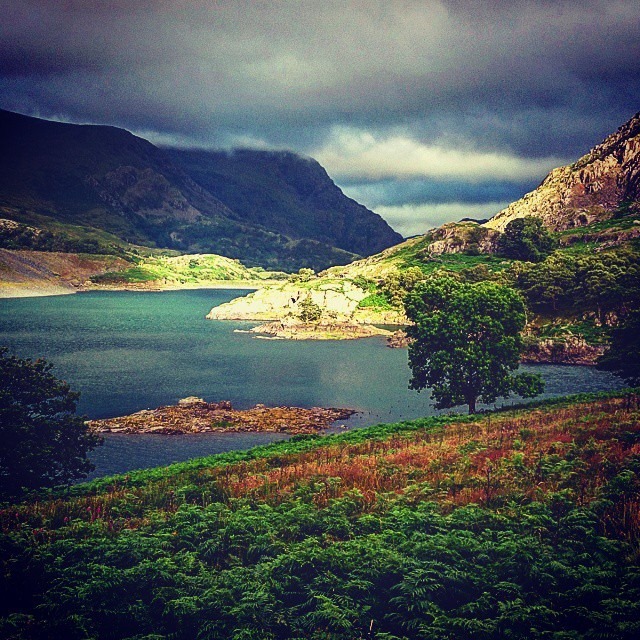 As was mentioned in a previous post, A Break From the Norm, i needed a weekend away from North Wales to recharge the batteries and revitalise my love of the place. In truth, it worked a treat and coincided nicely with a nasty cold i had contracted, rendering me almost useless. I came back Monday night and pretty much headed straight to bed before going back to work on Tuesday. That evening, i was determined that i’d shaken off the worst of it and was keen to get back on it and, now that the Indy Aggregate had begun again, i was heading down to tick some problems. It would be difficult to argue with 46 problems in a session, including a healthy number of 7s if i had felt anything close to healthy. Looking back, the coughing and spluttering rendered the session unwise. Fully fit it might have worked but considering i was struggling to breathe, it did take it’s toll. What’s more, i managed to pump myself out to such an extent that it took until Saturday for the pain in my left forearm to subside. Wednesday i had a session in the wall at work, mainly coaching but that soon gave way to having a play on my outstanding project and discovering a hold had changed. It has now been substituted with another of a different colour, although this has now made the barely-possible dyno at the end even harder. I doubt i’ll be able to convince anyone else to try it again. This session, of course, didn’t help my recovery in the slightest and Thursday, clenching my left fist caused large pain in my forearm. Nevertheless, desperate to get back to the form i’ve been in all summer, i opted to head out to the remaining unclimbed project, called Hiding in Plain Sight (with a sit down start to be named Planing in Hindsight). Once again, this turned out to be an error and despite not starting until nearly 6, i was done before nightfall at 7:30, my forearm still giving me grief and my energy levels still very low. Whether i wanted to or not, i had to rest. An evening with Ruth and Ffion on Friday came as a welcome distraction and meant i was pretty much back to normal after just over a week. The clincher was Saturday night, following Wales agonising defeat to the Aussies in the rugby, i headed back to the Indy to try and get a few more off the sheet. Of the 70 problems to have gone up, i’ve now done 58, with two that could be flashable left to do and a couple of others just waiting to be finished. And then tonight, i’ve been back in the Pass. So things have started to look up, with a bonus this week: two days ago, i posted an article called The Teaching Conundrum, on the merits of teaching youngsters do jump from the top or climb down. I posted it on my Facebook profile and was astounded as the view count went through the roof. By midnight, the page alone had seen nearly 150 views – 30 more than any page on any day on my entire site. While there were some comments disagreeing afterwards (and justly so) it did get a lot of traffic onto my site and did get people thinking. And i guess those are the two things the site is for! I hope you enjoy it or that. And thanks for reading. 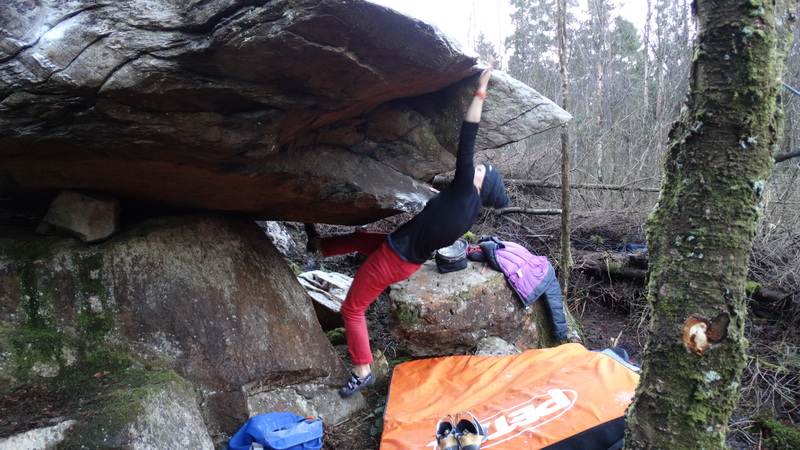 This is part ten of a series of posts all about the turning points in my climbing career. From single moves to huge time spans, these are the events that shaped me into the climber and person i am today. 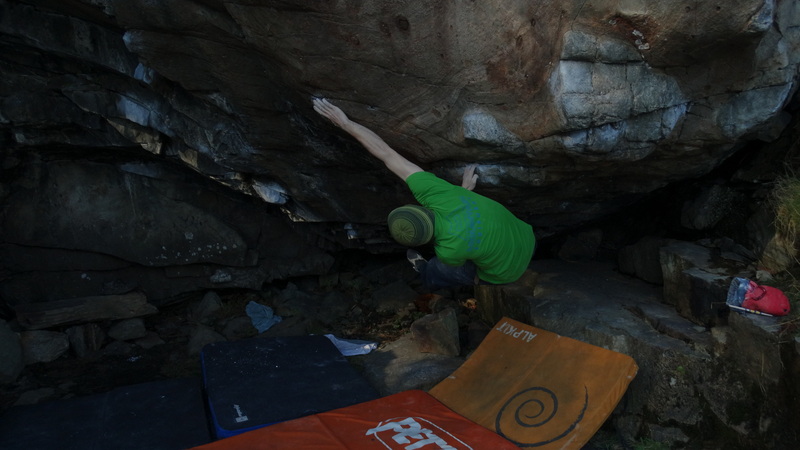 This is part one of a series of posts all about the turning points in my climbing career. From single moves to huge time spans, these are the events that shaped me into the climber and person i am today. So why did i chose this as the venue for my enjoyable and convenient weekend off? Because it is in this forest that lie my recent discoveries and current unclimbed (and as such ungraded) projects. 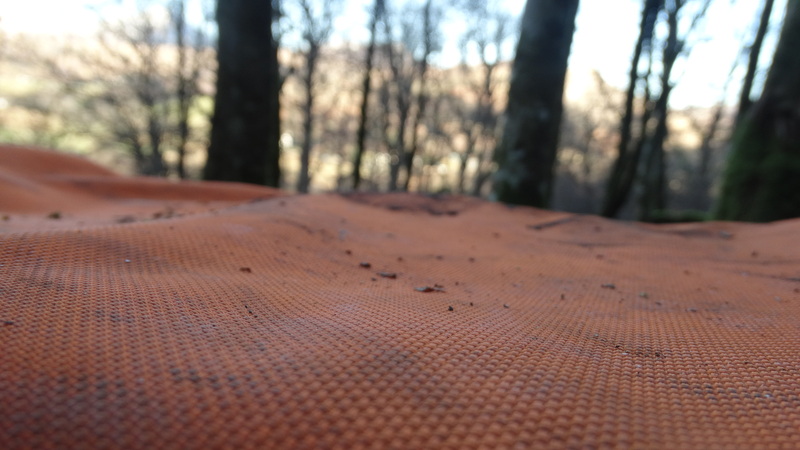 I found them in the latter stages of last year, received an early Christmas gift on Christmas Eve, culminating in my first Welsh first ascents and have been waiting ever since for an opportunity to return. 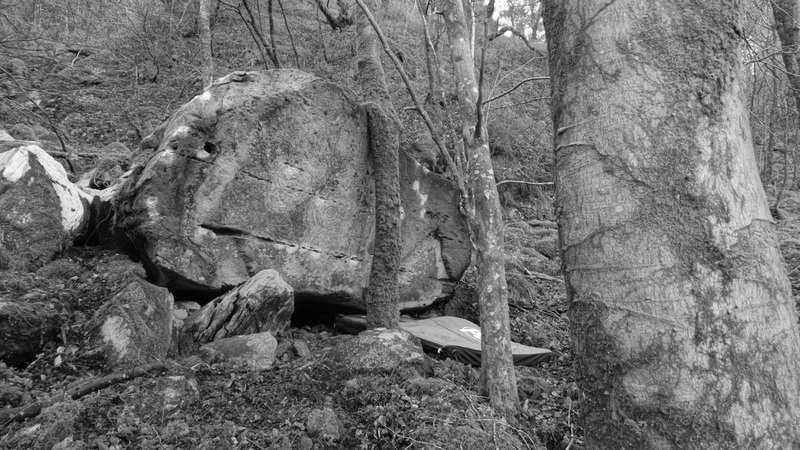 Beaten back on multiple occasions by time constraints, wet weather and on one occasion, a sheet of verglas covering the top of the boulder, it’s been frustrating me that i have yet had chance to return. So when this weekend rolled around, there was no hesitation on where to head. Saturday morning and i rose fairly slowly, allowing the air to warm to a more amenable temperature and drove to meet my companion for the day, Serena. I’ve been very careful over who to take to this boulder, Serena being an ideal companion and joining a currently elite list of trusted souls. We met, collected Tess and wandered in, the path to this new site slowly becoming more obvious. Conditions were good – not so cold as to kill enthusiasm but chilled enough to offer good friction. We began by introducing Serena to only her second outdoor bouldering venue, and a few attempts at Christmas Comes Early 5+. 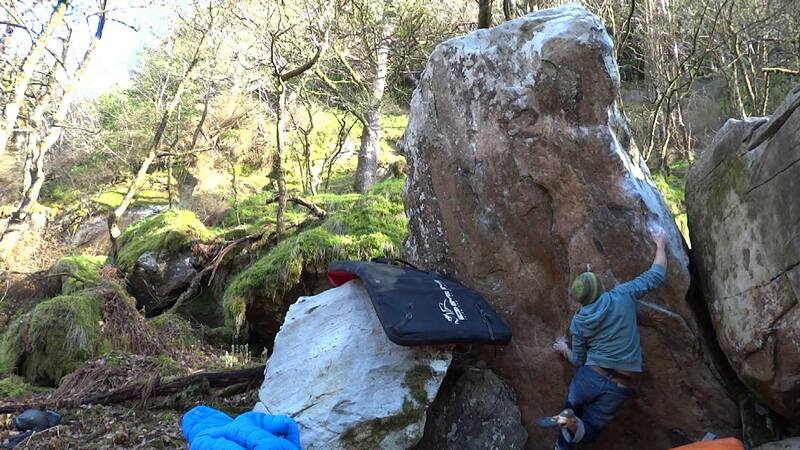 A good warm up for me, a good tick for her and (after a quick look at the problem now known as The Dichotomy of Good and Evil and thought to be around 7c) before long we’d moved around to try another first. Originally the line went from the shelf straight up through a tricky mantel, albeit with good feet. 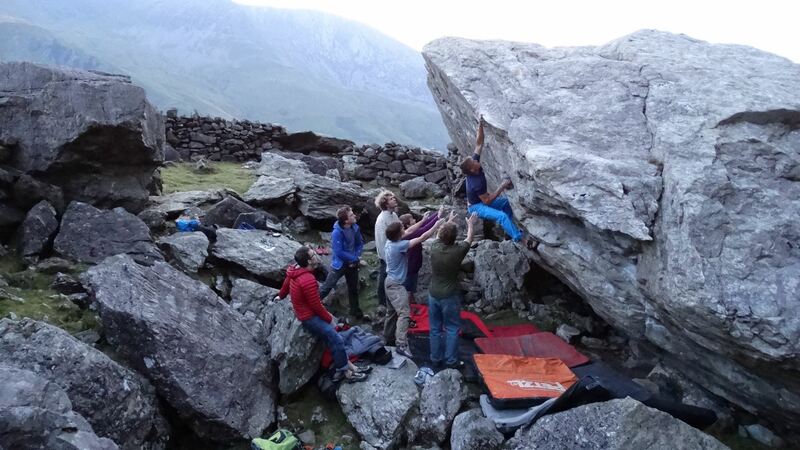 Slowly, the line moved, evolving as the moves fell into place and by the time it was climbed, followed a rising traverse line to finish into my premier problem on the boulder, Storeman’s Legacy 7a+. While not what i had originally imagined, it gave a more natural line – something i imagine is commonplace when making up the problem for yourself. It has maintained it’s original name of New Direction, somewhat fitting considering the history of the line and has a speculative grade of 6c until someone can confirm. It, and my other firsts on this bloc, can be seen on the video below. Another of my finds has an unfortunate stream that runs right through the middle. It is also a jumbled array of rocks, meaning it is very difficult to reroute said waterway and thus, offers little opportunity for ascent. 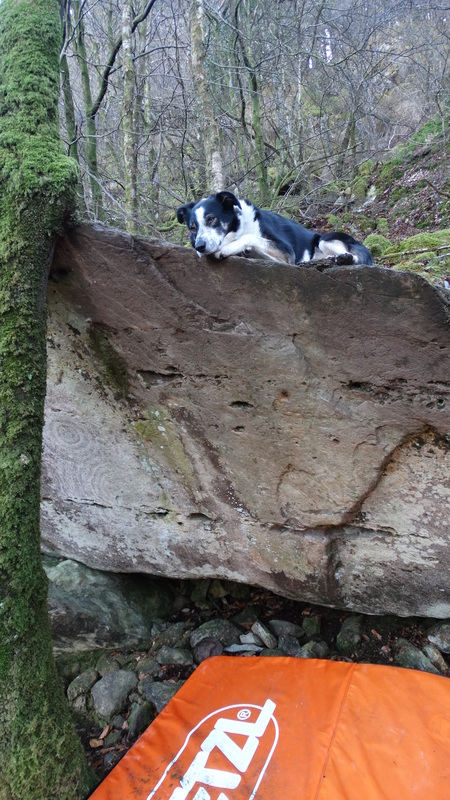 So imagine my delight on Friday when i headed down to find the stream dry and the climbing possible. A beautiful day allowed me to climb three new routes: firstly Bull’s Eye 7a, named after the concentric circle formations on the rock when i first arrived. I’d speculated with a few people as to what they were and how they were formed; i quickly discovered once on the rock proper that they’re actually dirt formations… As such, if you end up there, please take care not to disturb more than i unfortunately have already. It is a very fun climb, with every move slightly harder than the last and is started in the low pocket shared with the next line. 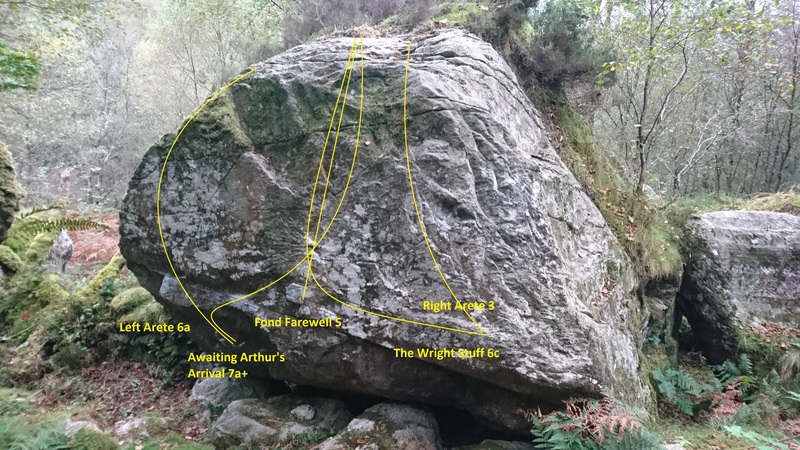 This is to it’s right and called Bull’s Arse 6a: a six-foot problem that seems a touch pointless but does give nice moves when started low and makes a good warm up. Finally on the left arete, Bull’s Large Protrusion 6c is named after the unfortunate jutting rock that nestles just above one’s backside once you pull off the floor. This move was considerably more difficult, almost to the point of impossible, before the loose shale-rock was removed and scattered on the floor to give a more solid standing. Again, as above, this was done exclusively with my hands, merely pulling and pushing loose rock until it became free. Those three ascents fell surprisingly quickly and soon i was heading home, delighted with my achievements for the weekend. It has ended with a great sausage casserole and David Attenborough on the TV, bringing this week’s delightful days off to a fitting end. I now have to recover and hope that next weekend follows suit, to allow me to go back and tick off some more. It’s amazing what a fresh pair of eyes will do for you. In this case, i’ve not taken anyone with me, so i don’t mean literal fresh eyes; i suppose a fresh outlook would be more apt. Either which way, it would seem that plenty who’ve walked an unnamed wood (unnamed for first ascenting aspirational reasons) before me can’t see the wood for the trees. I know i’m not the first to go exploring in this particular little corner of the world – partly for it’s prominence to North Wales equivalent of hustle and bustle and partly because i’ve spoken to people who tell me they have… The one thing they have in common is they’ve all reported the same news: “nothing new in there, mate!” or words to that effect. Well something has clicked in my head recently, meaning i’m looking at things a bit differently and wow, the stuff i’m finding has the most amazing potential. A boulder here, a scar (or four) there, a knarly looking rock slab there, wherever i’m looking, i’m seeing new untapped resources. This may actually be the long term dream i’ve always craved. Of course, it’d be easy to miss them, to give those mentioned before (and myself) some dues; every one is as green as grass, camouflaged against the overgrown surroundings, possibly only detectable with a different, fresh mindset. And of course, i may be very wrong, they may be complete dross but while it continues to leak liquid from the sky round here, there’s nothing really stopping me from going and giving them a brush to find out. I guess that’s what separates the first ascentionists from the rest. Hopefully anyway.